“Dinosaur 13” has its Madison premiere on Saturday, Nov. 22 at 4 p.m. at the Union South Marquee Theatre, 1308 W. Dayton St. as part of the UW Mini Indie Film Festival. PG, 1:31, three stars out of four. “Dinosaur 13” is a love story that spans different ages, although it’s less a May-December romance than a Cretaceous Era-Cenozoic Era one. The suitor in question is Pete Larson, a scruffy paleontologist who ran the Black Hills Institute for Paleontological Research in the early 1990s. 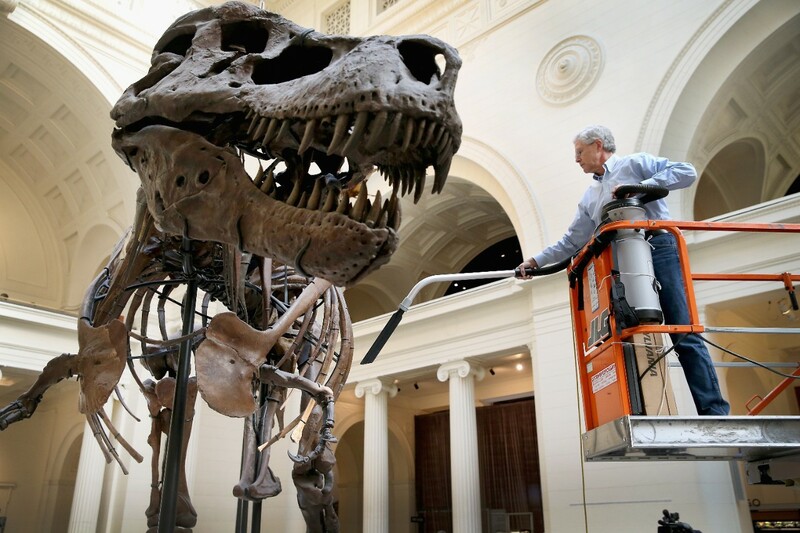 And the girl of his dreams was Sue, a 65 million-year-old intact Tyrannosaurus rex fossil that Larson and his team uncovered in South Dakota. In the gripping documentary “Dinosaur 13,” Pete and Sue face obstacles larger than anything Romeo and Juliet had to deal with to keep them apart. Thrilled at the find, Larson’s team brought Sue back to their lab in tiny Hill Town, patiently uncovering and preserving all the material. The footage of the unearth T. rex skull is especially stunning, with its pocket-knife sized teeth jutting out. Remember this was pre-“Jurassic Park,” so Sue was the closest thing the world had to understanding what a real, intact T. rex looked like. Sue attracted a lot of attention nationwide — and along with that attention came a lot of legal trouble. 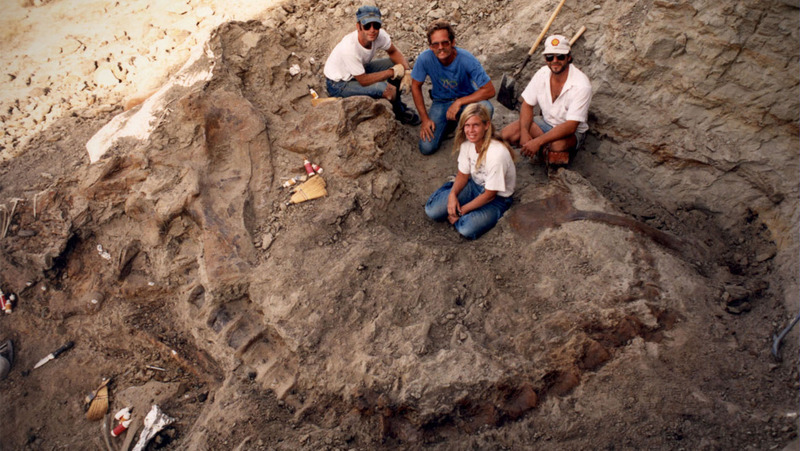 It turns out that the land Larson found Sue on was owned by a farmer, who got paid $5,000 by the paleontologists for the fossil. But the farmer had put the land in a trust with the federal government. And the land also happened to be within the borders of a Native American reservation. And then the farmer claimed there was no $5,000. So you had three different entities, all with a plausible if murky claim to be the real owners of Sue. That was enough for the FBI to descend upon the Black Hills Institute in 1992 and seize fossils and records by the truckload, including Sue. Later, they came after Larson and the Institute in a whopping 159-count indictment alleging that the group stole fossils off federal land and illegally sold them overseas. One of the fossils not mentioned in the indictment, bizarrely, was Sue. Here a complex story spins into even more complex strands, as both Larson’s freedom and the fate of Sue hinge on byzantine regulations involving everything from land ownership statutes to customs disclosure forms. It’s a credit to director Tod Douglas Miller that he keeps “Dinosaur 13” as suspenseful as it is despite relying on all this minutiae. The film is pretty basic documentary filmmaking — archival footage plus talking heads — but these are entertaining talking heads, especially Larson, who on camera combines a professorial enthusiasm with an earnest depth of feeling, maybe too deep, for Sue. Miller reenacts Larson’s nightly ritual of sneaking over to the government compound where Sue’s bones were being kept and talking softly to her, like Romeo in the bushes outside Juliet’s window. “Dinosaur 13” is a tale with courtroom drama and scientific wonders, but the thread that pulls us through is a good old-fashioned tale of unrequited love.